Shapoorji Pallonji Group massive presence in construction, home appliances, shipping, power, biotechnology, real estate, engineered goods and more is happy to expand its presence in order to excel in every segment. Recently, Shapoorji Pallonji Group has launched the new residential project “Joyville Gurgaon” in Gurgaon sector 102 and most interesting part, this project is available in appealing price that is hard to find in Gurgaon. So this creates an opportunity for the home buyers and investors to buy a property that fits in every aspect to get high advantages. Let us start with the project Joyville Gurgaon and know about its benefits. I think the number of amenities is endless because here the Shapoorji Pallonji group has placed everything beautifully to create a luxury address that retains comfort, peace and happiness for every family. 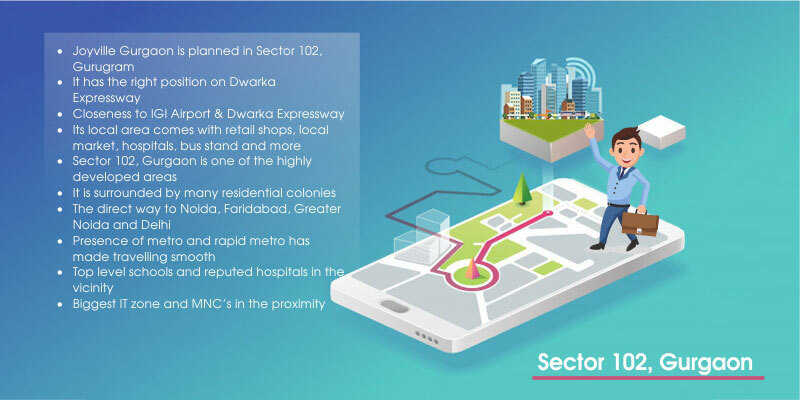 Yes, Joyville 102, Gurgaon is worth its weight in gold because being one of the hot properties in Gurgaon it is also affordable and needless to say, finding an affordable property in Gurgaon is little daunting as all top notch projects are available. Creating its own space and position in the market, the builder has earned the attention of its customers; after all, Shapoorji Pallonji has assimilated everything so beautifully that it captures newness, perfection and change. Come rain or shine, location is 100 per cent important and it is also better to talk about it when we talking about the project, so let us get the snapshot. Now if we keep every factor together, it concludes that this mentioned project is surely lucrative and those who really want to move to a new address and even investors looking for a profitable deal can go for it wisely to lock a project that never fails to deliver the best.